Getting paid by your clients is hard enough at the best of times. Send invoice. Wait for reply. Check bank account. Email client. Repeat. A bank transfer is the cheapest and most common way of getting paid. However, it’s not always that easy as it requires your client to go to the bank or login to online banking. Wouldn’t it be better if you gave your clients an easier way to pay you, meaning you retrieve payments quicker and it saves time for them? 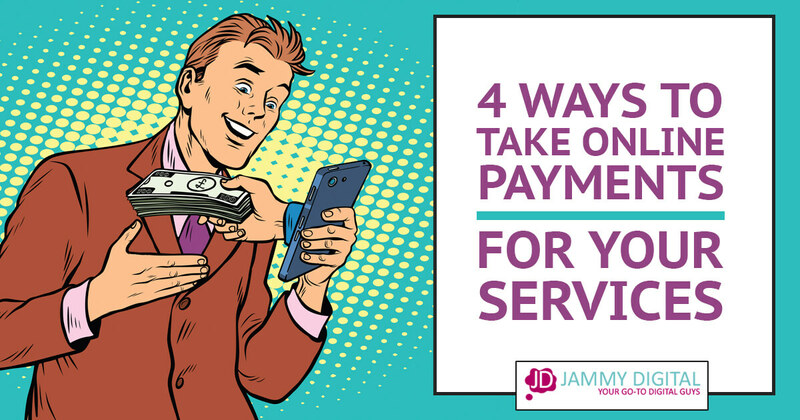 It’s really easy to take payments via your website, and in this article, I give you four ways to take payments. Essentially, this includes any service that you’ll want to take a one-time fee. In most cases, it’s not worth adding a heavy duty shopping cart facility such as Woocommerce (a WordPress plugin) to your website. 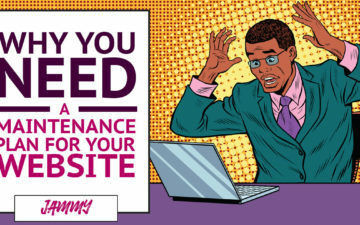 It’s far better to keep things clean and simple so it doesn’t slow your site down. PayPal needs no introduction and I’m sure you’ll already have an account open with them. I occasionally use this method to collect one-off payments. PayPal makes it easy to display a button on your website so you can take a fast payment. You can even email your client a direct link which sends them straight to PayPal to make a payment. You can also set up subscriptions very easily too. Click on the item named “PayPal Buttons” on the third row. On the next page, you’ll be able to get the button code and copy and paste it on to your website. Alternatively, you can click the email tab and send the link directly to your client. If you sell less than £1500 per month then PayPal charge 3.4% + 20p per transaction. So for example, if you charge £200 for a product, PayPal will charge £7.00 in fees. If you charge £1000 for a product, PayPal will charge £34.20 in fees. If you sell more, between £1500–£6000 per month through your account then the fee is reduced to 2.9% + 20p per transaction. The more you sell, the less your fees will be. The PayPal dashboard can be difficult to use although they have made improvements. Although they are very popular, PayPal is not my favourite method of taking payments. I would generally use them as a last resort. I’ve had my funds held in the past for no reason and their fees are a lot higher than other companies. Stripe is the new-ish kid on the block and is a great alternative to PayPal. It has a very nice dashboard area and it’s simple and easy to navigate. Unlike PayPal, Stripe does not have an easy to use button you can place on your website. It’s slightly more advanced and I wouldn’t recommend doing this unless you know code. But don’t worry there is another option. If you use WordPress there is a free plugin you can download that allows you to add a “PayPal style” button to your website. 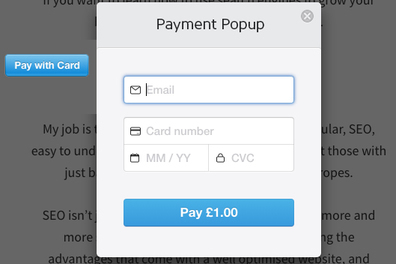 It adds a nice popover box where your user can fill in their card details without leaving the page. *Note, you will need to ensure you have an SSL certificate installed on your website so your customers’ details are safe. You’ll notice that the WordPress page is showing an error and asking you to enter your Stripe API keys. These can be found by logging into your Stripe account. As you can see the form show a “test” marker. This is so you can test the payment button before making it live. Stripe is much cheaper than PayPal charging only 1.4% + 20p per transaction. So for example, if you charge £200 for a product, Stripe will charge you £3.00 in fees. 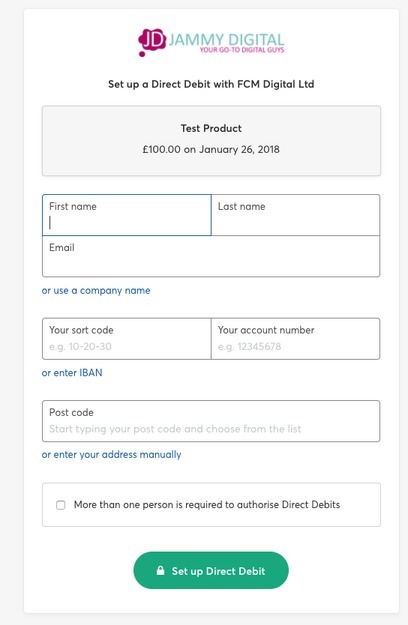 If you charge £1000 for a product, Stripe will charge £14.20 in fees. So you can see why more people have started to use Stripe as an alternative to PayPal! This is what the Stripe button and pop-up window look like. Click the button in the background and the pop-up window will appear. In my opinion, everyone should have a Stripe account. More and more companies are integrating their software with Stripe, which will make things even easier going forward. However, the process of adding a button to your website can be tricky. Even with the extra plugin, it’s still not 100% reliable because the plugin is not owned by Stripe. This requires the plugin author to keep on top of any updates. All round, Stripe is a great service but you will probably need other tools to make it work. SamCart is a bit different from the previous options as it isn’t actually a payment processor. It acts more like a sales page. It’s my preferred choice at the minute and for good reason. The great thing about SamCart is that it comes with really nice checkout pages. This means rather than using the standard (boring) PayPal or Stripe pages to process payments you can have something a bit more attractive. There are lots of templates to choose from and it only takes seconds to create a payment link. The reason SamCart is slightly different is because it works alongside your Stripe account. This means you’ll still have to pay Stripe fees but you won’t need to mess around with plugins or code to display the payment buttons on your website. Your SamCart checkout page is hosted by them, so the only thing you need to worry about (from a technical perspective) is including a link on your website to your SamCart product URL. Easy. Login to your SamCart account. Enter the name of the product, the price and a short description of the product. On the next screen, you can choose a template that you like and use the “preview” button on the top right to see how it looks. 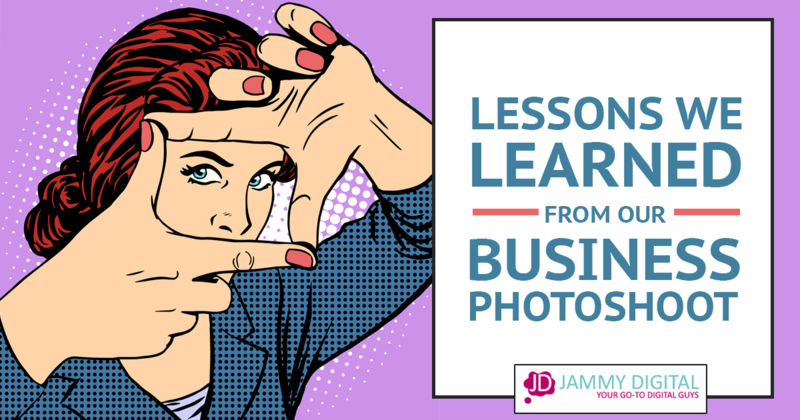 At this point, you could publish your checkout page but you can also edit the sales page as much as you like by adding images, bullet points and a guarantee. Once you’re happy with it, you can include a link to this page on your website. SamCart could work out more expensive as there is a monthly fee. You have to pay $19 per month + 1% transaction fee, and then the Stripe fee on top. If you charge £1000 for a product, you will have to pay around £24.06 in fees (combination of both SamCart and Stripe fees) AND the $19 (approx. $13.84) subscription, which is a total of £38.01. However, do remember that the $19 cover all transactions in one given month, so your second transaction would be far cheaper than what’s outlined above! This is what the SamCart checkout page looks like. This is only one of the main templates available. I love SamCart, it takes a few seconds to set up a product and sales page that you can send to your clients. 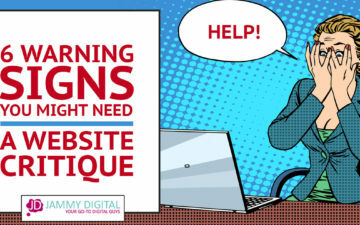 You can easily add a link to your website and send people straight to the sales page, and it comes with beautiful templates that are customisable. They do charge a $19 monthly cost, which means you have to be making monthly sales to justify it. For me, it’s completely worth the money. SamCart is my preferred choice for taking one-off payments. Combining SamCart and Stripe means I have the stability of Stripe and the ease-of-use that comes with SamCart. GoCardless is a wildcard option as it’s completely different from all the others but it’s very cheap so I decided to include it in the list. GoCardless is different because it charges your customers via a direct debit rather than using a credit/debit card number, expiry date etc like you would with Stripe. Fundamentally, this service is ideal if you offer a subscription type service where you charge a customer on the same day each month, however, you can also use GoCardless for one-off transactions too. IMPORTANT: The next box that appears will ask you to specify a number of payments. You simply enter “1” this will ensure the customer is only charged once rather than a recurring payment. GoCardless only charge 1% which makes it the cheapest option by far. They have a maximum fee of £2 per transaction. So for example, if you charge £200 for a product, GoCardless will charge you £2.00 in fees. If you charge £1000 for a product, GoCardless will still only charge you £2 in fees. This is what the GoCardless Checkout page looks like. It’s the only design available. 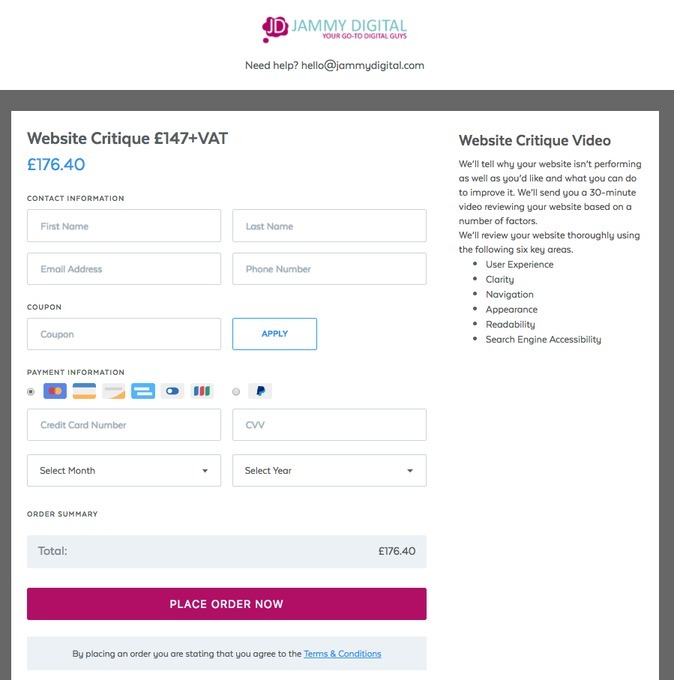 The checkout pages are very basic and you can’t customise the design. GoCardless is a very good service and it’s cheap. However, it’s not really set up for taking one-off payments which means you’ll have to be careful when setting up a plan for your customer. You don’t want them getting charged every month. It’s nice to have another option but I wouldn’t generally use GoCardless as my first choice. I hope you found this article useful. Over the years, I’ve tried lots of ways to take online payments and these are the few methods that I use on a regular basis. I currently use the Samcart and Stripe combo more than the other options, but you’ll have to decide which option is best for you. It’s completely dependant on your circumstances but at least now you’ll have a better understanding of the options available. Also note, it’s best to have an SSL certificate on your website. The third party processors I’ve listed above are the most popular and reliable, however, it’s always best to have that extra layer of security. Have you tried any of these methods before? How did you find it? I’d love to hear your comments below. Just a small point but GoCardless charges 1% with a maximum of £2, so the fee you pay for a £200 product is the same as a £1000 one. Thanks very much for that. I’ve amended the article and added that £2 max fee to the Pros list.